Maharaja Duleep Singh and his journey to discover his own lost existence during his exiled life in England. If you watch films just for fun or to go to multiplexes to shun away the day to day stress, you are a non-believer, especially not a follower of Sikh faith, then this film is absolutely not for you. Irrespective of all above things if you still want to watch ‘The Black Prince’ then obliviously you are the one prefer realistic cinema over popular one. But even then, before you go, you should be aware that you have to bear with lethargically slow screenplay for the first forty minutes. If you are still ready to go, this certifies that you are the real devotee of meaningful cinema. Then, let’s start to dissect ‘The Black Prince’. 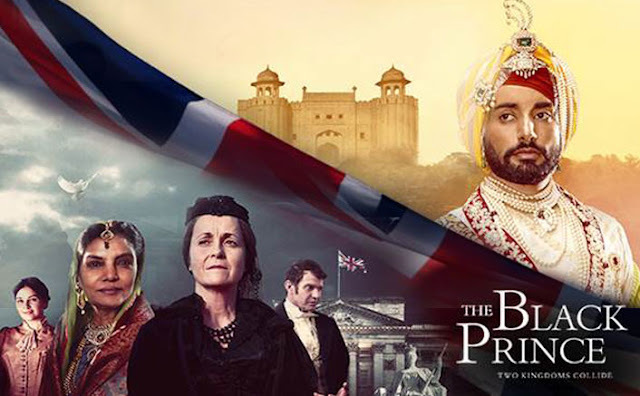 Inspired by the English novel ‘The Exile’ by former Indian diplomat and author Navtej Sarna and two other English books based on real life of Maharaja Duleep Singh, The Black Prince is written and directed by Indian-born British actor, writer, director and producer Kavi Raz. The film begins from the point when Duleep (Satinder Sartaaj), living in England, succeeds in persuading his British guardian queen Victoria (Amanda Root) to allow him to visit his long lost mother Maharani Jinda (Shabana Azmi). At this point of life he has grown up as a firm believer of Christianity and living a happy life adapted to English culture with the pension provided by the Queen. With affection, Queen Victoria calls him ‘The Black Prince’ who shares a warm relation with Duleep Singh. After the reunion with his long lost mother, he learns about his past; about the reality that who was he; the successor of Lahore Darbar and how British rulers cunningly snatched him away from her mother at the age of five and annexed their glorious empire in British India after the sad demise of his great father Maharaja Ranjit Singh. Learning about his tragic past, he vows to return to his own land and re-instate the lost Sikh Empire and faith of his own people, on his mother’s deathbed. The discovery of his tragic past and his mother’s death turns his life upside down. He starts yearning to find out and connect with his real being, his identity and his roots. Tossing between the cultural paradoxes, he plans his return to his homeland. Dejected by the rejection of his pleas, he starts preparing for the mutiny against British India to reclaim his throne. He goes to Paris, the US and Russia, to join hands with the rebellion enemies of Britain. But this turns out to be a painful journey. Feared of his return and regaining the unconquerable empire of his forefathers, British rulers start hampering his path. The rest of the story depicts his unending efforts to return to his own soil and his tragic death as a pauper in a hotel in Paris. With this film, Kavi Raz tries to rummage through that unexplored chapter of the history of the Punjab, about which even the historians have no consensus. For the common audience this story might have been a historical journey if it could have succeeded in capturing the undivided attention for 118 minutes. Unfortunately Kavi’s screenplay is devoid of this miracle. The sequence in the beginning where Maharani Jinda narrates the whole story of the past to Duleep is out rightly boring and lethargic. While as director Kavi tried to insert flashback shots in between the Maharani’s narration, but instead of creating an impact through action, narration turns out to be a burden. Shabana Azmi’s wonderful acting tries to infuse some life into the dull story telling, but when story stands frozen at one point in the very beginning, the audience starts yawning. Her flawless satirical delivery, at a few occasions, to vent out her anger against British invaders, comes to rescue, though it is like a cumin seed in the camel’s mouth, but thankfully, it gives a moment to smile. After Maharani Jinda’s death story starts to accelerate and paints the atmosphere into the deep gloomy helplessness of Duleep. After the dead slow beginning director becomes a jumping jack. The sequences demanding details pass in a flash. The director has deliberately desisted from exploring the layers of Duleep’s relationship with his two wives. Even when he leaves his first wife and offspring from her to return to his soil, then why he marries another woman when he was busy in planning the rebellion in Paris, the film is silent about that. Before that, when he decides to move on to his mission, his first wife expresses her feelings for him, but in between, the whole struggle what Duleep feels about her and his second wife who comes later, this whole chapter remains obscured. It instigates a thought that was Duleep such brutal and indifferent towards his own wives and children? That’s why in the end when he asks his son to fulfill his dreams he turns them down by terming them as outdated. The strongest part of The Black Prince is its climax. The last Maharaja of Sikh Empire, who could never rein his kingdom, laying in the bed of a hotel room in Paris, looks fragile, but still sounding in high spirits, though helpless to do anything, forecasts the freedom of India from British Imperialism. Later a voice over tells us that the Maharaja was buried in a foreign land against his faith and his last wish to be cremated on his own soil in conformity with Sikh rituals. The struggle to bring his mortal remains to India is still going on. The royal clan, who reined the largest Sikh Empire once sprawling from Yamuna to Kabul-Kandhar, lost its last trace with his demise. Shabana Azmi is the real savior of The Black Prince. In her small appearance, she leaves an enduring impact. At some points she seems to struggle to pronounce Punjabi words, but that’s due to the bookish translation of dialogues. In a royal wardrobe, singer turned actor Satinder Sartaaj makes his screen presence felt in his debut role, but lacks that subtleness which such a complex character requires. He keeps wearing a gloomy look throughout the film and there is no variation of expressions in the changing course of action and atmosphere. Amanda Root is strictly okay as Queen Victoria while Jason Flemyng steals the show with the emotional rendering of his character of Dr. Login; the caretaker of Duleep Singh. Sartaaj is best at what he is known for; he penned down soulful lyrics and his deep voice leaves you longing for more. Especially the song ‘Dardan Wala Desh’ will definitely arouse a nostalgic feeling, in Punjabi Diaspora, about their belongingness to the motherland. Music by Prem and Hardeep is another feather in The Black Prince’s cap. Shot in breathtaking museums, palaces and monuments, Aaron C. Smith’s cinematography gives an antique look to each frame. Filmed in the candlelit backdrop the whole atmosphere is smitten with artistry. The editing could have been crispier. The overall feel of the film is like a tele serial. Produced with a huge budget of $ 5 Million in English, Hindi and Punjabi, The Black Prince shatters all the high expectations. But if you are really interested in watching the mislaid journey of the last emperor of the great Sikh empire and you can endure the slow pace without demur then you shouldn’t miss this different kind of cinema.